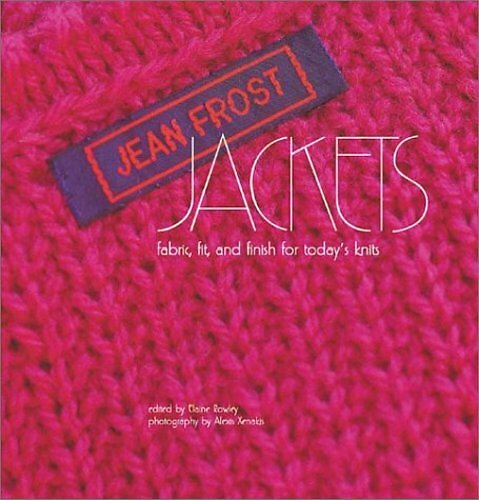 From ‘Jean Frost Jackets’: I designed this jacket a few years ago using the stitch pattern featured on the cover of Mary Walker Phillips’ book of knitted counterpanes. When I saw this stitch, I knew I had to use it in a jacket. I have worn my jacket shopping, to luncheons, and in the evenings to dinner and the theatre. I love its versatility. SIZES: Extra Small/Small (Medium/ Large). YARN REQUIREMENTS: Light-weight yarn, 1800 (2200) yds / 9 (11) skeins. SHOWN IN: Brown Sheep Naturespun Sportweight, #48 Scarlet. 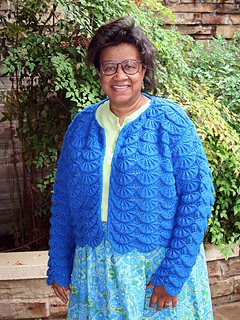 CONSTRUCTION TECHNIQUES: 3-needle bind-off is used to connect shoulders, slip-stitch crochet used to join seams and insert sleeves.